The first bookmobile in the United States was started by Librarian Mary Titcomb in 1905you can read more of the details at WHILBR and PBS. 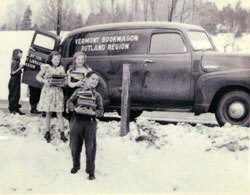 The first Bookmobile in Vermont started in 1922. Service was suspended in 1974 for almost 20 years but was later resurrected. Here is an overview from 2001 and if you want to read more, check at your local library for Vermont Life MagazineBookmobiles are Back!Volume 128, Spring 2004 by Ann Marie Giroux. 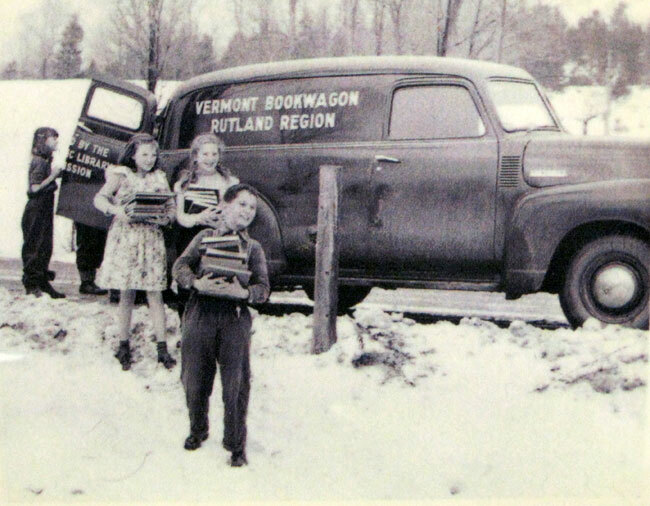 Today there are still some Bookmobiles operating in Vermont. Here is a list of our "Brave Bookmobiles". Fletcher Free Library in Burlington operates an outreach vanmostly for elderly patrons. The Cobleigh Public Library in Lyndon almost lost their program but a very generous donation has allowed them to purchase a brand new vehicle and they will keep operating. Here is an article when the program was in jeopardy and here is the happy conclusion. The Milton Public Library in Milton has a Bookmobile named Millie but it looks like she is not operating at the moment. The Franklin County Early Childhood Program in Swanton and Saint Albans runs a Bookmobile. The Dorothy Alling Memorial Library in Williston runs a Bookmobile named Dottie during the summer. of Libraries and June Osowski of the Rutland Free Library. Here are a few links for Bookmobile nuts like us! Check out this flickr group for some really cool photos. We would love to have one of these Bike Bookmobiles.